Random House, New York, 1984. 164 pages. This is Number Seven in the series of The Three Investigators. I was terribly disappointed when my interlibrary loan came in and apparently I hadn’t specified that I only wanted the original 1967 edition. However, I’m pretty sure the only change is that Alfred Hitchcock was changed to “Hector Sebastian,” a fictional “detective turned mystery writer” rather than a famous actual movie director. This is another mystery, full of action and danger. As in many others, two of the Three Investigators get captured at some point in the story. A lot of luck is involved in the successful solution of the case, but there is also some deduction. And, as has become customary (I didn’t even notice this from when I read them as a kid), there is a boy from another country who is in on the investigation. In this case the other country is Great Britain, so at least there are few stereotypical elements in the boy’s personality and way of speaking. This mystery includes some written clues – thus making it more of a puzzle than some, and also making it a type I particularly enjoy. Though the clues are not quite as clever as those in The Stuttering Parrot, and I thought the whole process of following red herrings had a few too many coincidences. But it’s still a fun puzzle to watch Jupiter Jones work on. 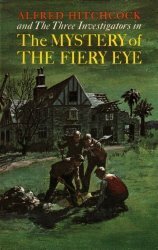 The Mystery of the Fiery Eye is notable in that it finally has a girl make an appearance! Not a very flattering example, but at least this book acknowledges that girls exist! The girl, Liz Logan, is talkative and eager. “Look, don’t you ever need a girl operative?” Liz was asking eagerly. “I’m sure you must on some of your investigations. There are times when a girl would be a big help. You could call on me. I’m a terrific actress. I can use make-up to disguise myself, and I can change my voice and –“ . . .
Bob took the card and climbed into the truck beside Hans, not even noticing the blue sedan that passed them. He was thinking that Liz seemed like a pretty nice sort, and maybe a girl could help them sometime. It was true Jupiter had little use for girls, but if the right occasion ever arose, he’d suggest they call Liz Logan. I honestly don’t remember if Liz shows up later or not, but I think I vaguely remember some such thing.